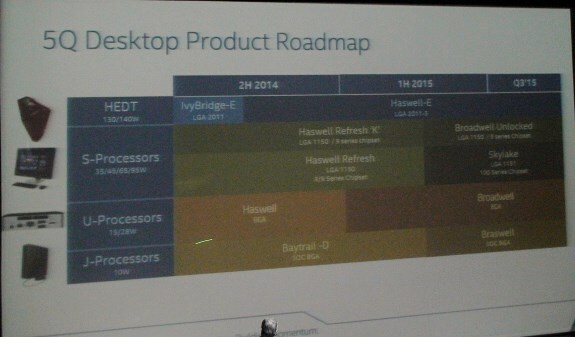 Intel revealed an updated version of its desktop roadmap at the Intel Technology Conference 2014 in Athens. The first thing you can see on the roadmap is that Intel's flagship lineup will remain unchanged or the foreseeable future, the Haswell-E will continue to serve the ultra-high-end market until at least the end of Q3 2015. The roadmap confirms rumors Skylake will be introduced shortly after Broadwell but both chips will go after a different segment of the desktop market. Broadwell will be a BGA chip for Intel's U-series of processors with TDPs of 15W and 28W, these processors are primarily used for compact desktop systems. The BGA version of Broadwell is anticipated in Q1 2015 and the roadmap reveals that an unlocked version of Broadwell will follow in Q2 2015. Broadwell Unlocked uses the LGA1150 processor and requires a motherboard with 9 series chipset so it should be compatible with Haswell Refresh. Interestingly, Broadwell Unlocked doesn't seem to be part of the usual K-series but the more mainstream S-series. Broadwell Unlocked will come in TDPs of 35W, 45W, 65W and 95W. Next the roadmap also officially reveals that Skylake is planned for Q2 2015 as well, this chip is part of the same S-series as Broadwell Unlocked and fits in the same 35W to 95W TDP range. Skylake uses the LGA1151 socket and requires a new motherboard with a 100 Series chipset. The exact differentiation between Broadwell Unlocked and Skylake remains unclear, it's believed Broadwell Unlocked will be more performance-oriented while Skylake focuses on DDR4 support and more powerful integrated graphics. The third new chip coming in Q2 2015 is Braswell, this J-series SoC has a 10W TDP and is intended for the most compact and passive desktop systems.